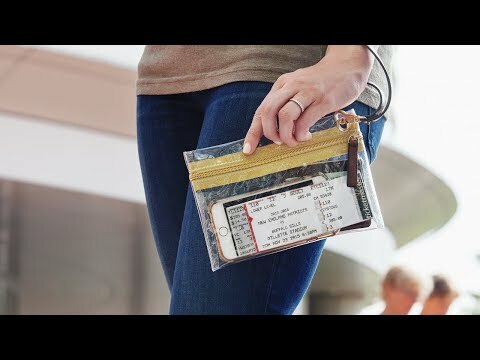 With your essentials stashed in a clear stadium bag, you’re on the fast track through security checks at concerts, festivals, and other large crowd events. These vinyl carryalls were made with common stadium security regulations in mind, but with handbag-esque details (like faux leather trim and metal accents) that elevate them to a fashionable accessory. Dimensions: Tote: 12” x 12” x 6”; Chain Purse: 8” x 5” x 3”; Phone Purse: 4.5" x 6" x 1"; Wristlet: 8" x 5.25" x 1"
I loved how big this tote is!!! Me & a few if my friends were able to put our billfolds & phones in it at the college world series. From festivals to the big game, a clear stadium bag is a must-have for large crowd events (and if you want to keep the security check line moving). 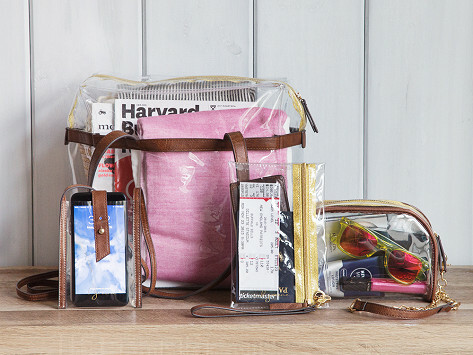 And the transparent tote, wristlet, phone bag, and purse from mb greene are all made with stadium security in mind. Many venues will only allow clear bags in—and when we checked our local football stadium, we learned that mb greene’s bags fit the requirements perfectly. We think they’re a great choice for easier traveling, too. Mary Beth Greene created her range of clear designs with an eye on handbag-worthy details, like faux leather straps and trim, gold stitching, and metal accents. So the bags are not only security compliant, they look great, too.